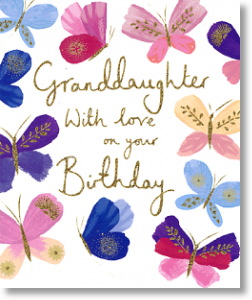 Delightful Granddaughter Birthday card filled with a painted array of pretty, fluttering, dancing butterflies. In vibrant colours, each butterfly has a delicate touch of gold glitter detail. Writing on the front is also in gold glitter.